If you are a gourmet cook, you may well keep extra virgin olive oil in your kitchen, right there where it's easy to reach. Olive oil is not just a great cooking oil, it's also a treat blended with vinegar for a salad dressing or dripped on rustic Italian bread. Whatever you use olive oil for, the amount in the bottle seems to diminish before your eyes, and before you know it, it's time to refill the bottle or get another one. If you are a refiller type of cook, cleaning the container first is a must. 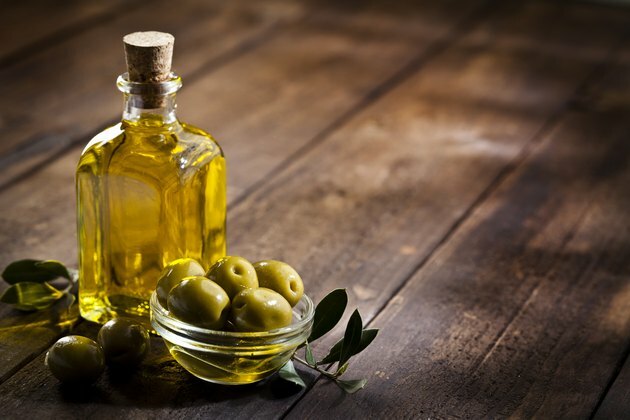 Olive oil is currently one of the most popular cooking oils in this country, used by fans of the Mediterranean diet, as well as everyone who loves Italian food. Some buy grocery-store olive oil and toss the bottles in the recycling bin when they are empty. But others have a special oil bottle that they use and refill as part of the cooking ritual. If you fall into this latter category, you probably already know how important it is to get that residual oil out of the bottle. Even quality oil may get rancid over time and begin to taste and smell awful. It's easier to clean the bottle regularly than to try to remove the rancid smell once it's set in. So cleaning the bottle is important, but how to do it? Water alone won't get the oil bottle clean because water and oil are such different liquids. And don't forget the small problem of the narrow bottleneck and the spout on top, if there is one. It's going to be difficult to get a bottle brush into the bottle, but that doesn't make it impossible to clean. Everybody has their own favorite way to clean an olive oil bottle, but most are variations on a theme. In every case, you want to pry off the spout top, if there is one. Then, fill the bottle up part way with hot – but not boiling – water, shake it up and pour it all back out. Repeat several times. A good cleaning method to try early on is liquid dish soap. Fill the bottle halfway with hot water, this time adding a few drops of dish soap, the kind you use to wash dishes in the sink. Cap the bottle or seal the top with a thumb and, once again, shake it all up well. Pour out the soapy water and rinse well. Repeat as many times as necessary, then dry the bottle by hanging it upside down. The soap cuts the oil, so it has a good chance of getting the bottle clean. But there are other variations that are reputed to clean better. One method calls for adding a tablespoon of vinegar to the soapy water before you shake. Then, rinse well. Another favorite method is to add a few tablespoons of uncooked raw rice to the bottle once you've half filled it with water and added soap. It is claimed that when you shake the bottle, the rice grains "scrub" the inside walls. This method costs very little, so give it a try. A third option is to use fuzzy pipe cleaners. Twist a few together and poke one end inside, moving it along the walls and into corners to wipe off the oil.